Dr Ian Walker was struck by a bus and a lorry during the experiment. He was wearing a helmet both times. But the Royal Society for the Prevention of Accidents said tests have shown helmets protect against injuries. 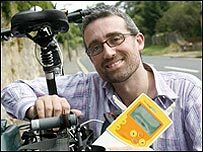 To carry out the research, Dr Walker used a bike fitted with a computer and an ultrasonic distance sensor to find drivers were twice as likely to get close to the bicycle, at an average of 8.5cm, when he wore a helmet. The experiment, which recorded 2,500 overtaking motorists in Salisbury and Bristol, was funded by the Engineering and Physical Sciences Research Council. Dr Walker, a traffic psychologist from the University's Department of Psychology, said: "This study shows that when drivers overtake a cyclist, the margin for error they leave is affected by the cyclist's appearance. "By leaving the cyclist less room, drivers reduce the safety margin that cyclists need to deal with obstacles in the road, such as drain covers and potholes, as well as the margin for error in their own judgements. "We know helmets are useful in low-speed falls, and so definitely good for children, but whether they offer any real protection to somebody struck by a car is very controversial. "Either way, this study suggests wearing a helmet might make a collision more likely in the first place," he added. 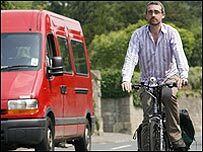 Dr Walker thinks the reason drivers give less room to cyclists wearing helmets is because they see them as "Lycra-clad street warriors" and believe they are more predictable than those without. He suggests different types of road users need to understand each other. "Most adult cyclists know what it is like to drive a car, but relatively few motorists ride bicycles in traffic, and so don't know the issues cyclists face. "There should definitely be more information on the needs of other road users when people learn to drive and practical experience would be even better." To test another theory, Dr Walker donned a long wig to see whether there was any difference in passing distance when drivers thought they were overtaking what appeared to be a female cyclist. While wearing the wig, drivers gave him an average of 14cm more space when passing. In future research, Dr Walker hopes to discover whether this was because female riders are seen as less predictable than male riders or because women are not seen riding bicycles as often as men on the UK's roads. However, a spokesman for the Royal Society for the Prevention of Accidents insisted: "We wouldn't recommend that people stop wearing helmets because of this research. Helmets have been shown to reduce the likelihood of head and brain injuries in a crash. "[The research] highlights a gain in vulnerability of cyclists on our roads and drivers of all types need to take more care when around them."